On that Roman execution stake, Yeshua cried, “It is finished!” Our sin was crushed and our redemption was secured. The thick veil was torn from top to bottom and opened wide to welcome us into God’s presence! The deep tones of these ancient blue, purple, and crimson dyes were extracted from the mollusks found along the eastern Mediterranean Sea. 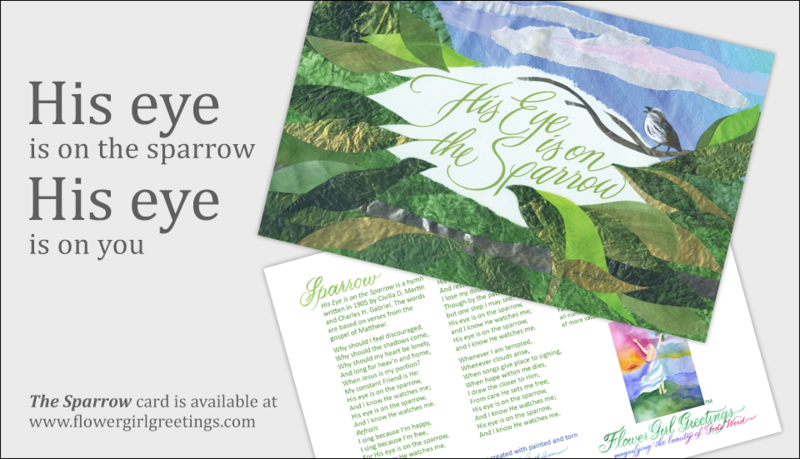 Their vibrant hues declare the message – There is no fear, only peace and joy! 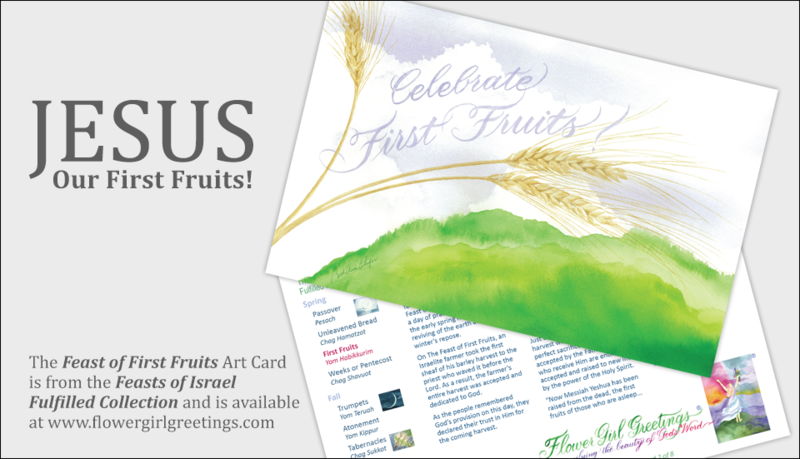 The Feast of First Fruits is celebrated on the Sunday that falls after Passover during The Feast of Unleavened Bread. It is a day of praise to the Lord for the early spring harvest and His reviving of the earth after the winter’s repose. Copy of He is risen! 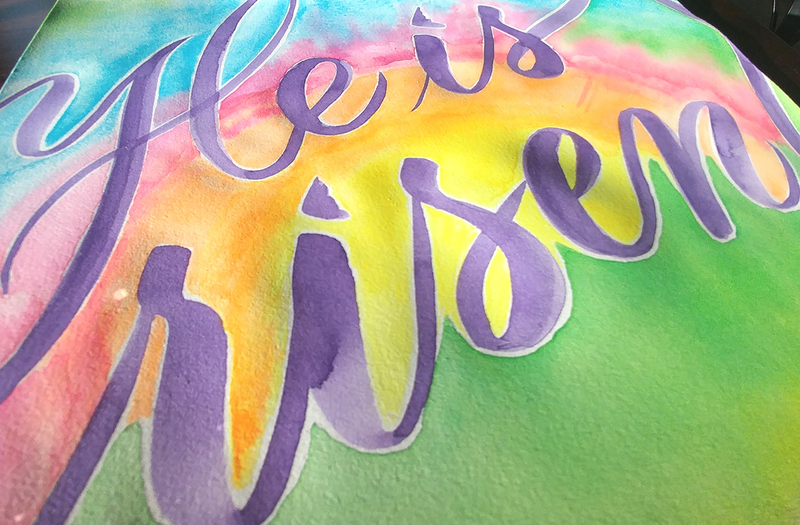 During the celebration of our Lord’s resurrection in our church growing up, we greeted one another with this phrase, “He is risen!” The responder would say, “He is risen indeed!” Amen! Blessings, love and shalom to you, dear friends, during this month of renewal, refreshing rains and resurrection! 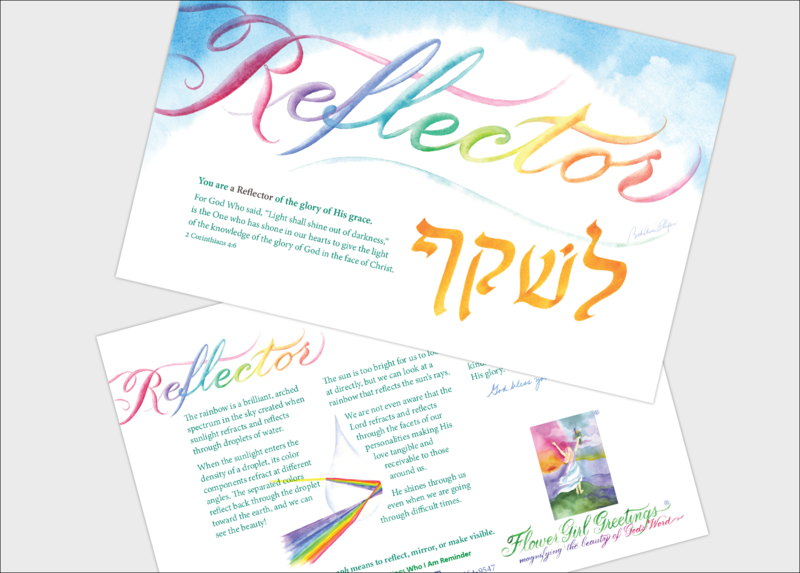 Our mission at Flower Girl Greetings is to magnify the beauty of God’s Word and make it easy for you to share powerful encouragement in a tangible and lasting way with art cards and Bible study tools! I’ve been sending a lot of emails, especially considering the spring celebrations. But for those of you who may be overwhelmed by the load in your inbox, my emails will taper off a bit! The celebration of the Feast of Lots or Purim (poo reem’) begins at sundown in two days on the 20th of March, which is also the first day of spring this year. The first Feast of Purim was recorded in the Megillah, the Scroll of Esther. 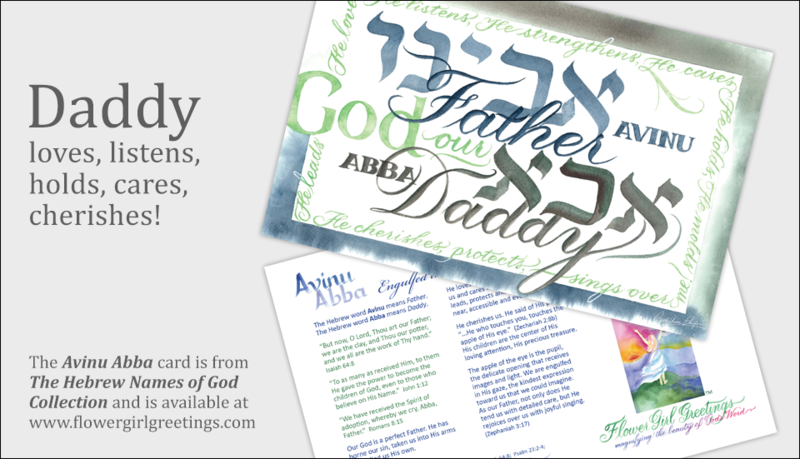 The Book of Daniel and the Book of Esther are part of the Jewish Writings and are often paired together—Daniel being about God’s faithfulness to His faithful people, and Esther being about God’s faithfulness to His people in spite of their unfaithfulness. This devotional may also be found at here. 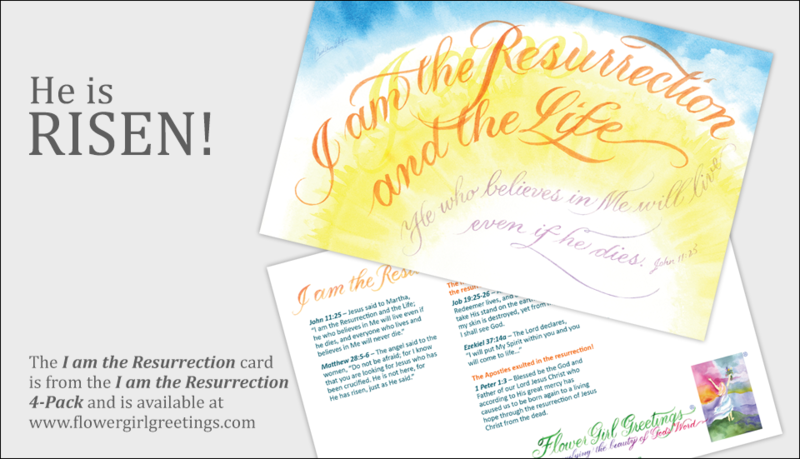 The Redeemer bookmark has been reprinted just in time for the Resurrection celebrations in April! 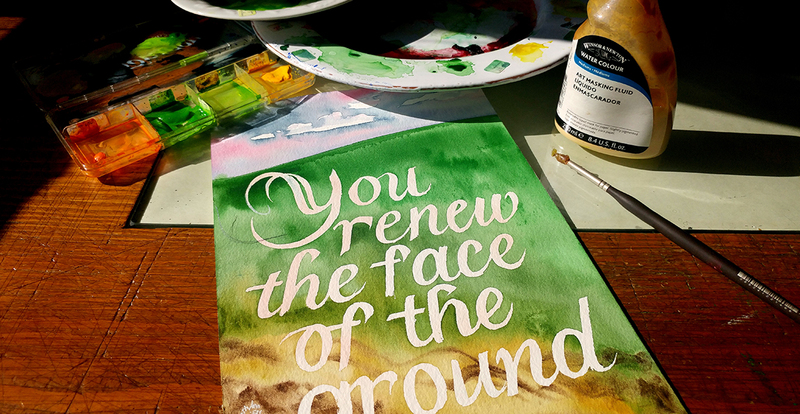 The words on the front are I know that my Redeemer lives (Job 19:25). 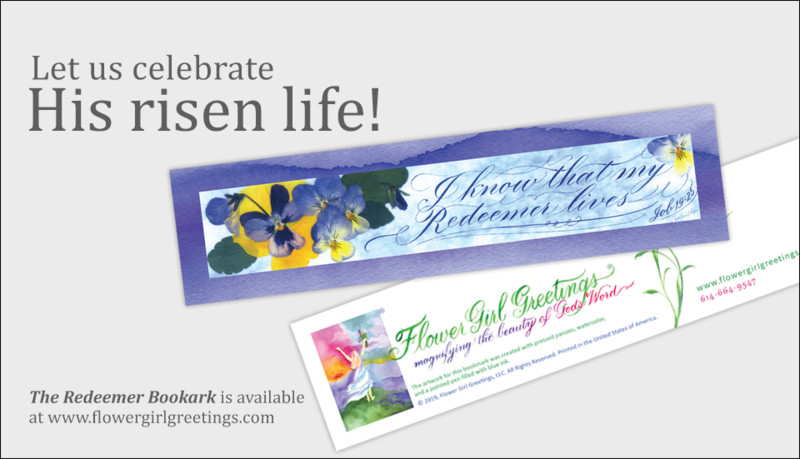 The Redeemer bookmark was originally our first business card; now, we have updated it to be a perfect gift to include in a Flower Girl Greetings Art Card. The letters on this bookmark were created with a pointed pen around the pressed-pansy design. Your Bridegroom, Jesus, is closer to you than you can comprehend. Yeshua is His Hebrew Name. After you received Him (John 1:12-13), you became His child. He surrounds you, but then came in you. Look for Him. Peer through your tangible surroundings to see Him there. Look all around for Him. Your loving Savior wants you to develop an increased awareness of His presence and His voice calling out in love every single moment. 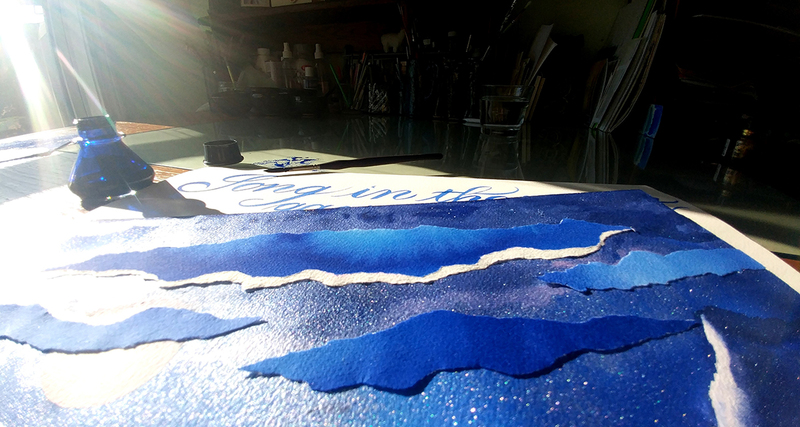 God’s Word and Other Art in my Home – Welcome! 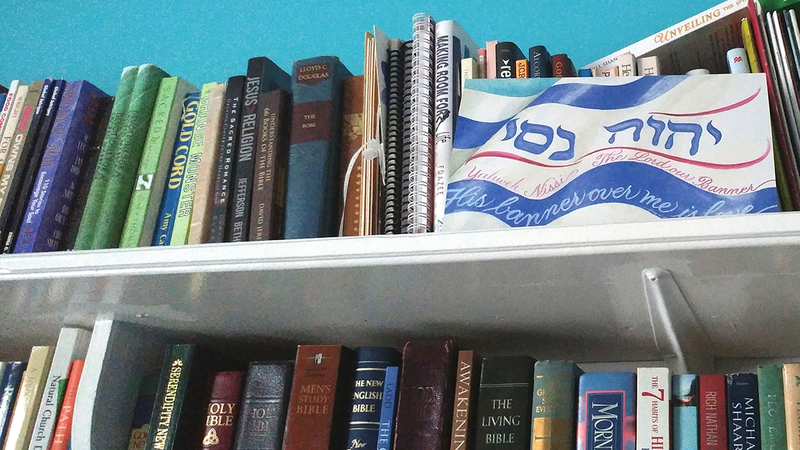 God's Word and Other Art in my Home—Welcome! Greetings today in the Name of our precious Savior! I enjoy hearing from you and often wish I could have an hour to get to know you in person over coffee or tea, but, of course, time does not always allow for this. We are in prayer about a possible women’s-retreat venue in the future where we can soak in God’s Word together. 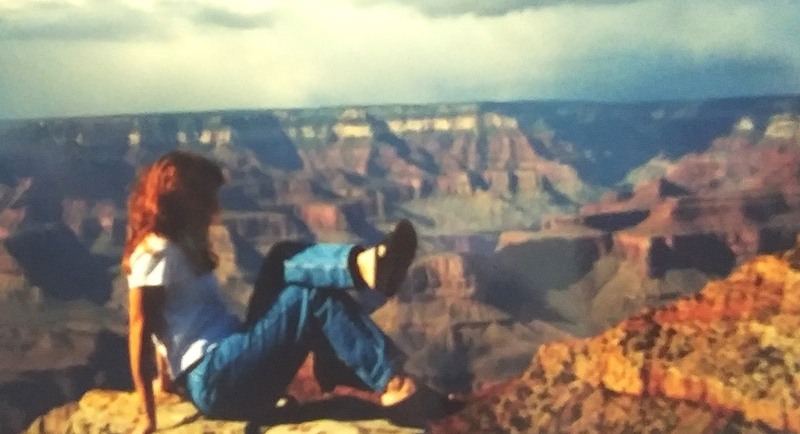 In the meantime, I wanted to invite you into my home and share a bit of my heart for beauty and God’s Word. 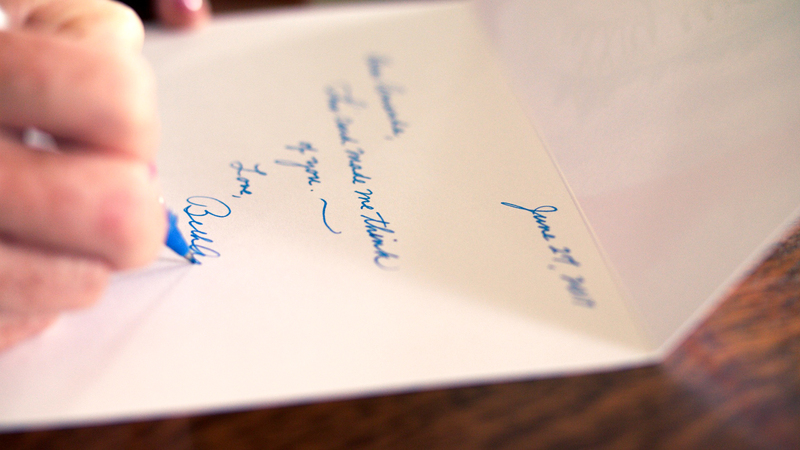 Within the Portrait Art Card Collection, Flower Girl Greetings spans the ages. The original artwork for the Lloyal Art Card was given to my friend, Brenda, for her birthday. 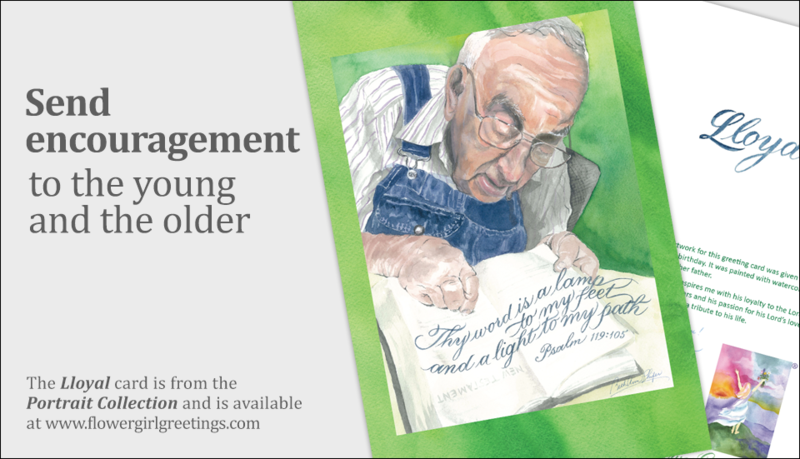 Are you discouraged or know someone who is? Discouragement comes in so many forms. It can be difficult to know the source. 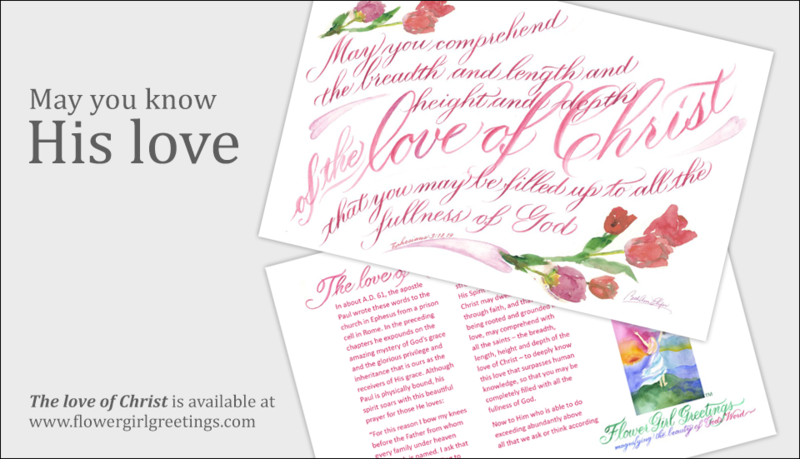 The love of Christ Art Card is from the Florals 2 Collection and is also available in a 4-Pack. 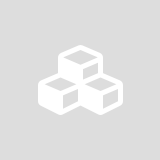 The You are a Reflector card is from the Who You Are Collection. You are a Reflector of the glory of His grace!